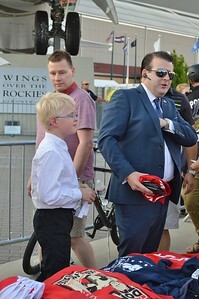 Donald Trump drew both supporters and protesters when he spoke at a rally in Denver. Woman holding anti Donald Trump poster flashes "peace sign". 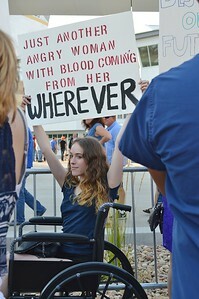 Young woman in a wheelchair holding up anti Donald Trump sign at Trump rally protest. 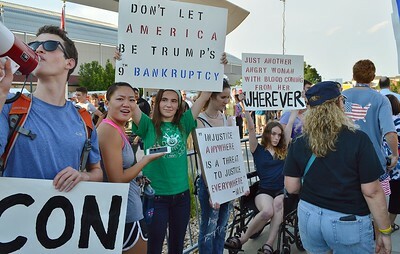 Group of anti Donald Trump protesters hold up signs as Trump supporters walk by. 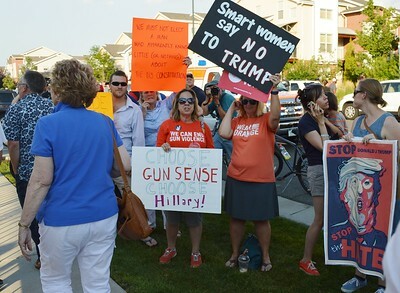 Anti Donald Trump protesters hold up signs as Trump supporters walk by. 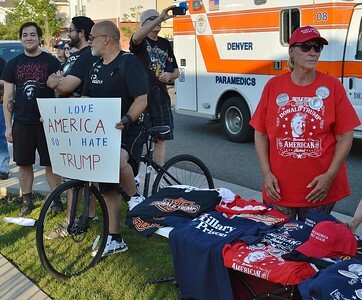 Man holding anti Donald Trump sign next to man & woman selling Trump shirts and hats ojn table in front of them. 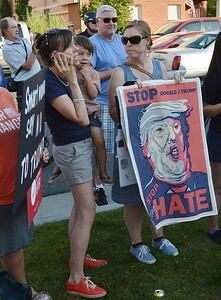 Woman holding anti Donald Trump sign, next to her another woman talks on cellphone while holding a child. 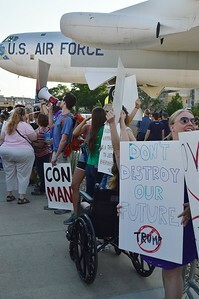 Line of anti Donald Trump protesters with signs, B-52 bomber in the background. 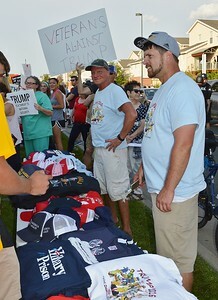 Woman wearing Donald Trump t-shirt selling t-shirts and hats stacked on table in front of her, man on bicycle with anti Trump sign stands next to her. Woamn holding up a "Go Hillary" sign at Donald Trump rally protest. 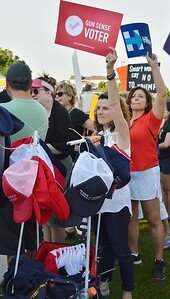 Woman holding "Gun Sense Voter" sign, behind her woman with a Hillary Clinton sign, in foreground a display of Donald Trump hats. 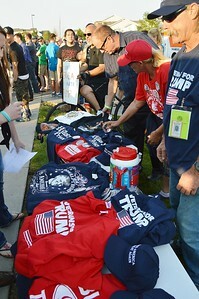 Trump supporters looking over a table filled with t-shirts and hats. 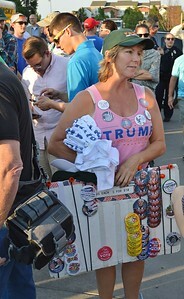 Woman wearing Trump shirt, holding display of buttons for sale at campaign rally. 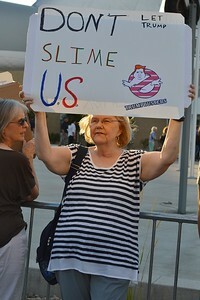 Woman holding up "Trumpbusters" sign at rally protest. 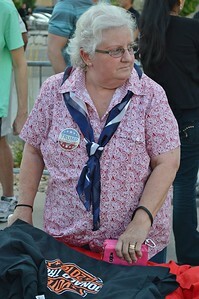 Senior woman wearing Trump campaign button. 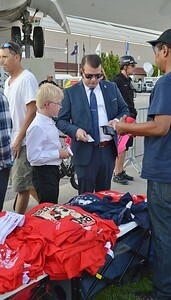 Man in suit, wearing bluetooth phone, pays for Donald Trump merchandise as young son looks on, large pile of t-shirts on table in front of them. 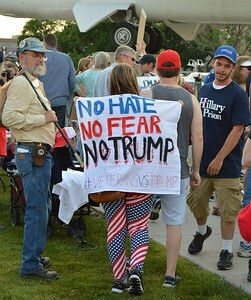 Young woman wearing American flag pants, holding an anti Donald Trump banner over her back. 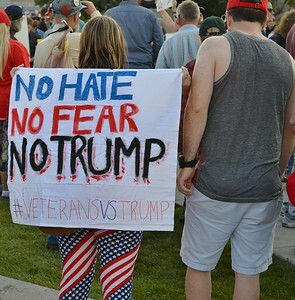 Young woman wearing American flag pants, holding an anti Donald Trump banner over her back walks through the crowd at Trump rally. 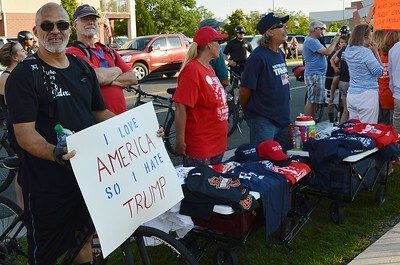 Two men selling t-shirts & hats at Donald Trump rally, anti Trump protesters with signs in thye background. 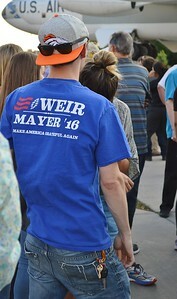 Young man wearing Denver Broncos hat and t-shirt that says "Weir/Mayer '16, Make America Greatful Again". 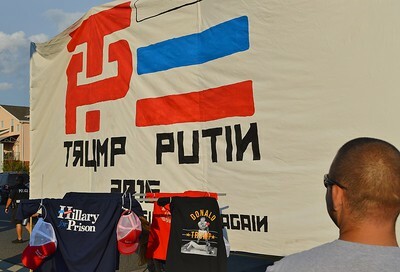 Large "Trump/Putin" banner hanging behind a display of Donald Trump hats and t-shirts. 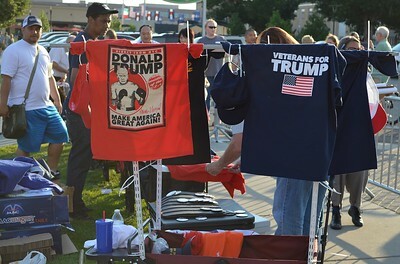 Display of Donald Trump merchandise including a t-shirt with a shirtless Trump as a fighter with boxing gloves on. 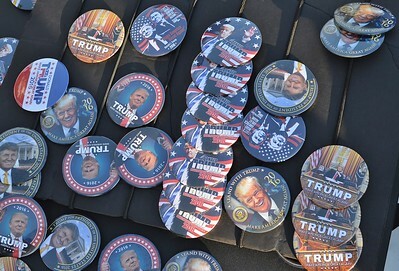 Assorted Donald Trump campaign buttons laying on a table. 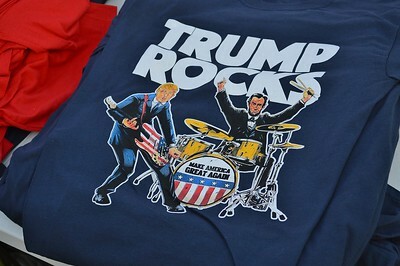 T-shirt with Donald Trump playing guitar and Abraham Lincoln playing drums, with slogan "Trump Rocks". 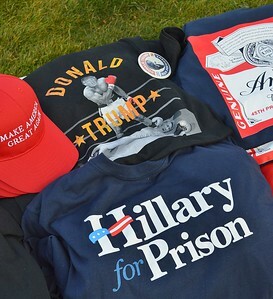 Donald Trump merchandise on table including t-shirt potraying Trump as a boxer who has just knocked out boxer Hillary Clinton, laying on the canvas in the boxing ring. 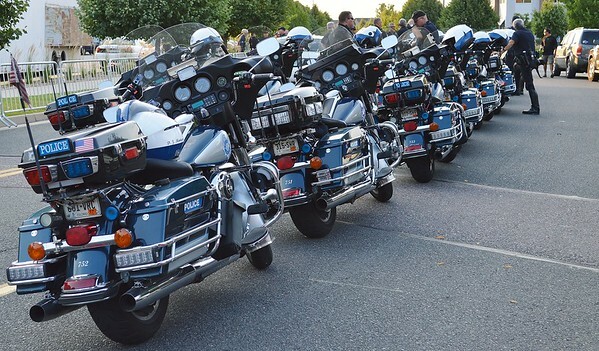 Line of Denver Police motorcyles parked at Donald Trump rally and protest.